One of the charms of the old Midnight Tracker radio show was that you would, from time to time, be exposed to something you otherwise might not have listened to. Some months ago, a friend asked me to keep my eye out for a record by the French singer Francoise Hardy. He passed along the title of the LP. I had to Google the rest, just to get a sense of what I was seeking. 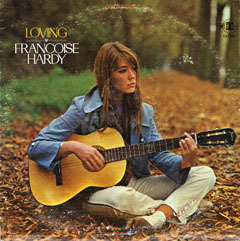 Last month, I came across a Francoise Hardy record while digging in my friend Jim’s basement. It didn’t match the title my friend gave me. Still, I had a hunch it might be the right record. Googling it a second time confirmed that. Having spent several months digging through H records and female vocalist records — when I remembered to do so — damn right I was going to put it on the turntable and give it a listen before passing it along to my friend. It was like listening to the Midnight Tracker back in the mid-’70s. Here was a record someone else liked, so why not give it a chance? “Loving You,” “Hang On To A Dream,” “Will You Love Me Tomorrow,” “Lonesome Town,” “Who’ll Be The Next In Line” and “Never Learn To Cry,” Francoise Hardy, from “Loving,” 1969. This is Side 1. It runs 13:44. The formula for “Loving” is a bit like that of Dusty Springfield’s “Dusty In Memphis,” which also came out in 1969. The Kinks cover is the best cut on the record. Hardy was 25 when “Loving” was released. By then already a huge star in France and Europe, she had set up a production company, Productions Asparagus. It gets the producer’s credit on this LP, so it seems that this is Hardy, in English, the way she wanted to do it. Truth be told, this isn’t a record I’d buy for myself. But I am glad I heard it, and I’m delighted to be able to pass it along to my friend, to whom it really matters.